Since the announcement of the route of this year's Tour de Yorkshire I have been thinking about cycling in this great county! It has been a while since I last rode in the Yorkshire lanes - in fact it was during the Grand Depart in Yorkshire. I remember very fondly that lovely day in July 2014 when we parked up at Elland Road football stadium and rode into Leeds city centre to see Chris Froome, Fabian Cancellara, Alberto Contador and Mark Cavendish set off for the Tour de France (from Yorkshire) with over 190 other riders. 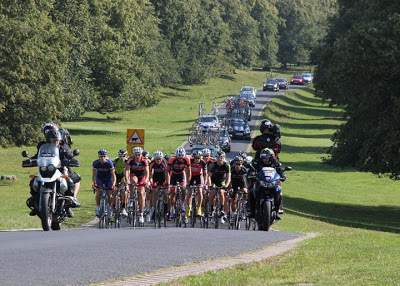 We then cycled on along closed roads with hundreds of other cyclists, up to the finish area in Harrogate. It was a shame Mark Cavendish crashed in the home strait, but we didn't let that get us down on what had been a fabulous day out. It's about time I went back up to the White Rose County, especially as I spent my childhood in different parts of Yorkshire, and in the past I have done a few great cycle tours of the Yorkshire Dales, Moors and Wolds. So which are the most noteworthy places for me? Stage 1 of the Tour de Yorkshire leaves from Beverley, a lovely little town. When I travel up to East Yorkshire to see my family I like to take my bike and most rides I do involve passing through Beverley. A café stop around North Bar Within or at one of the squares (Saturday Market or Wednesday Market) makes for a nice end to a cycle ride. The only King of the Mountains (KOM) bonus is on Greenhow Hill, near Harrogate. I have had mixed experiences on this 15% climb. The first time I rode up this hill was during a 200km audax event which began from Pateley Bridge. I had hoped to ride the route without needing to look at the map so the aim was to latch onto a group of local riders and stick with it. Unfortunately, starting the ride fresh off my drive from London was not the best idea. With no warm-up, tackling this climb so early into the ride was a bit tough on my legs. Consequently, I was unceremoniously dumped at the foot of the hill and left to crawl solemnly across the Yorkshire Dales for 20 miles, and over scary Fleet Moss before seeing another soul in Hawes. The next time I was at Greenhow Hill was during another audax ride which began in Wigginton, a suburb of York. As before, I adopted the same strategy of hanging on to a big group of riders, relying on the fact that the guy at the front knew the way. 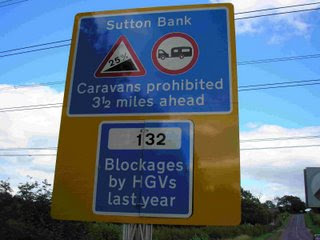 We soon paid for our error of being presumptive when the group of 20 riders suddenly came to a stop at the side of the road realising we had gone completely off course! Fortunately, another rider took charge and we all followed again. The fact that he had a strong local accent gave me a bit of reassurance that he knew where we were going - as opposed to the previous leader with his southern accent! Having a few (more) miles of warm up was definitely beneficial! We passed through the scenic town of Knaresborough, snacked at Ripley Castle Tea Rooms and had a quick look at the beautiful Brimham Rocks - all great preparation for the challenge! Once past Pateley Bridge the work began. On this occasion everyone stuck together on the hill at a steady pace, including on the sections that hit 18%. Once at the summit I smiled to myself in private celebration of having put the ghost to rest! I had conquered the Greenhowberg! World Champion Lizzie Armitstead's home town, Otley is the setting for Stage 2, which is also the course for the women's race that will be contested that day. It would have been good to run the route back towards Ilkley and then go up a nice little climb in the area used last year known as Cow and Calf (or côte de la Vache et le Veau for the French organisers). 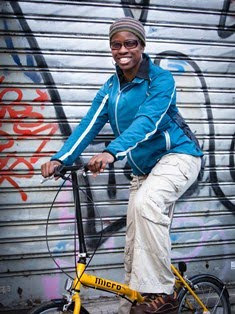 I rode it once when returning from the Yorkshire Dales to Leeds. It's lovely and wide open with beautiful views over Ilkley Moor. Had it been included in the route the couple of steep ramps would have made for an interesting start to the race. 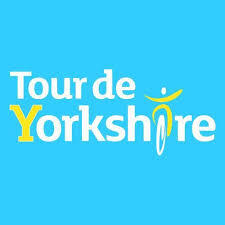 The last part of Stage 2 of the Tour de Yorkshire runs through areas that are a throwback from my childhood, as I lived in the area that straddles South Yorkshire and North-East Lincolnshire. I went to school around West Yorkshire and North-East Lincolnshire and remember journeys to netball matches and athletics meetings in different mining villages set in varying degrees of grimness. At least we experienced a bit of brightness in the gloom when we won quite a lot of our matches. I have fond memories of basking in Goal Attack glory outside the fish and chip shop a few times on our way home. Many of these villages became even gloomier after the decline of the local economy following the closure of the coal mines - notably between South Elmsall and Conisbrough. On cycle rides around this area in recent years I have noticed a lot of landscaping, which has markedly improved the cosmetic appearance of the villages. 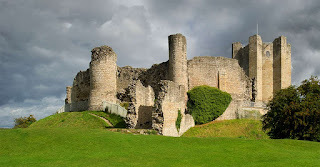 Sprotborough is particularly scenic and Conisbrough Castle is still there - as well as the hill, which the professional riders in the men's and the women's race can look forward to at the end of this stage. The étape reine is Stage 3, with lots of KOM points on offer from climbs within the North York Moors, among them Blakey Bank and Sutton Bank - one of the steepest classified roads in England. I rode up Blakey Bank during a cyclosportive as part of the York Rally Cycling event a few years ago. It was just like everything else in the North York Moors - no climbs below 15% gradient, hardly any flat stuff and you only have a few sheep and heather to motivate you as you grind your way up through the desolate moorland. Still, the views from the top are lovely once you get there! I wrote about my experiences of riding in this area on one of my weekend trips I did a few years ago. Happy days! The route for this year's Tour de Yorkshire looks very interesting, and I would certainly like to see how it unfolds both in the men's 3-stage race and the women's race on the Stage 2 course. Which section would I most like to ride? Stage 2 makes for a great nostalgia ride for me, but my heart says Stage 3 as I am a sucker for those punishing hills! The 2016 Tour de Yorkshire is on 29th April - 1st May and starts in Beverley.